American Desert is a ground forces map available in all modes. It was added in Update 1.81 "The Valkyries". In Update 1.87 "Locked On" the map was updated so that nearly all buildings are destructible. The map is set in 1950s America, specifically the deserts of Arizona. 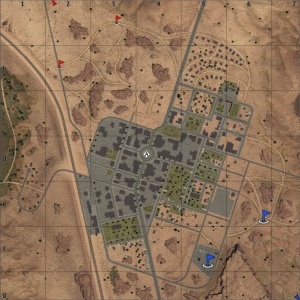 The map consists of a small town (approximately 1km x 1km), and the surrounding desert. To the west of the town there is a large lake with a small neighbourhood on its southern bank and to the east of the town there is a smaller lake. To the south of the town there are some small mesas, while the area to the north of the town consists of more open desert. Currently all layouts of the map, available in normal matches, limit the battle area to just the town and a small amount of the surrounding area. A unique feature of the map is an animated train which makes its way from the south of the map along a railway line, running past the west of the town. Players can destroy the train and the train can collide with players, with both situations often leading to the train derailing. The town itself is made up mostly of one and two story residential and commercial buildings, with a few three story buildings; it is made up of a few distinct areas. The south of the town is fairly open with some rocks helping to break up the area; it consists mostly of low density residential buildings, with a dilapidated fuel station in the south eastern corner of the town. The middle and northwest of the town is made up mostly of larger commercial buildings, with the west being taken up by a train station, one train is static and stopped at the platform, the moving train will pass through the station a few minutes into the battle. In the centre of the town there is a roundabout with a large statue in the middle of it. The eastern flank of the town, much like the south; consists mostly of low density, single story, residential buildings some of which have grass lawns while others have sand. There is also a large car park on the eastern edge of the town. The northeast of the town consists of a mix of residential and commercial buildings, more densely packed than in the south and east. Across the railway track, west of the town, there is a large lake with a small neighbourhood built up along its southeast bank, the banks of the lake a significantly lower than the surrounding terrain. To the south of the lake there is a tall hill; terrain to the south of the hill consists of uneven open desert. To the north of the lake the railway banks round to the west, leaving the map in the northwest, north of the railway the terrain becomes extremely uneven with many tall sand dunes. South / southeast of the town there are three tall mesas; the terrain between them is very uneven, being somewhat of a valley with numerous small hills and dips in the terrain; a number of dirt tracks cut through this area. To the east of the town there is a smaller lake with another small community built up on its eastern bank. Further east from the town the terrain turns into open desert, meanwhile to the north there is a tall hill with a radio tower and derelict hut at its peak. 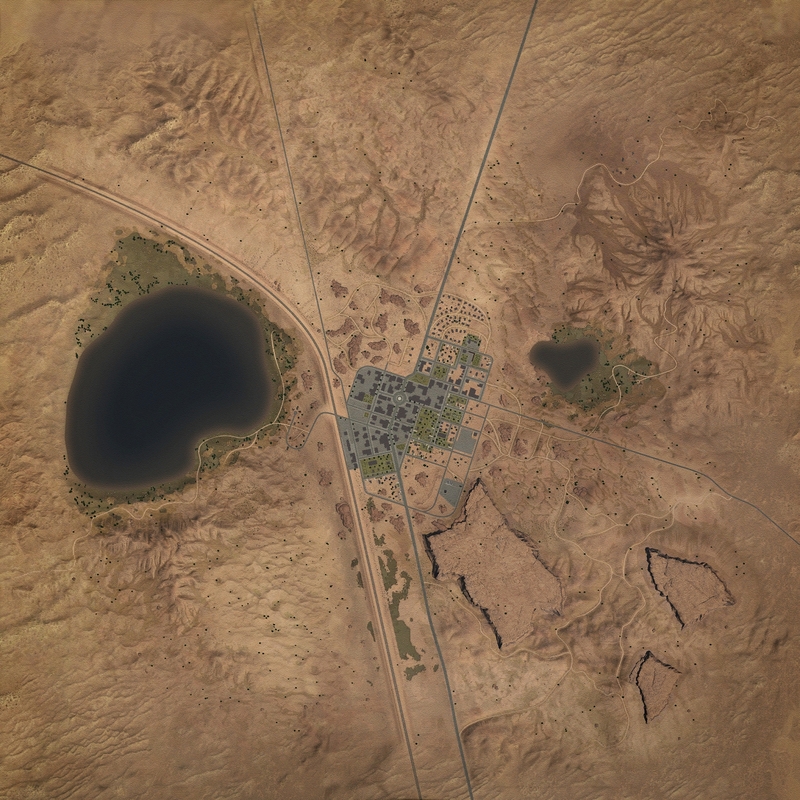 The area north of the lake is again largely open desert, but the terrain is much flatter than in other areas of the map, the terrain elevation is also notably lower than that of the main town. In the far northeast of the map there is a small rural settlement. The full tank battles map is 4km x 4km, however this is usually restricted to just the main town, see the table below for the restricted size available in each game mode. The air battles map is 65km x 65km. The map is a fictional location set in the deserts in the southwest of the United States, the buildings and visual style of the map were inspired by the city of Page, Arizona, however the layout of the map bears little resemblance to the real location. There are three capture points. Point A is at the train station in the west of the town, B is at the roundabout in the centre of the town, and C is at a church among the residential buildings in the northeast of the town. In AB point A is at the train station in the west of the town, B is at the roundabout in the centre of the town, and C is at a church among the residential buildings in the northeast of the town. In RB point A is at the train station in the west of the town, B is at the roundabout in the centre of the town, and C is at a church among the residential buildings in the northeast of the town. In SB point A is at the train station in the west of the town, B is at the roundabout in the centre of the town, and C is at a church among the residential buildings in the northeast of the town. In AB the capture point is at the train station in the west of the town. In RB the capture point is at the train station in the west of the town. In SB the capture point is at the train station in the west of the town. In AB the capture point is at the roundabout in the centre of the town. In RB the capture point is at the roundabout in the centre of the town. In SB the capture point is at the roundabout in the centre of the town. In AB the capture point is at a church among the residential buildings in the northeast of the town. In RB the capture point is at a church among the residential buildings in the northeast of the town. In SB the capture point is at a church among the residential buildings in the northeast of the town. In AB the capture points are located behind some commercial buildings east of the train station, and at a small park in the north of the town (near the roundabout). In RB the capture points are located behind some commercial buildings east of the train station, and at a small park in the north of the town (near the roundabout). In SB the capture points are located behind some commercial buildings east of the train station, and at a small park in the north of the town (near the roundabout). This page was last edited on 22 April 2019, at 15:23.